The companions of Chapter of Harmony No 220 and their guests were delighted to welcome the Assistant to the Provincial Grand Principals Christopher Butterfield, to their recent installation meeting at Garston Masonic Hall. The meeting was opened by the three principals, Ray Cross, Mark Mellor and Wyn Jones, who undertook the routine business of the evening, which included a successful ballot to bestow honorary membership on Alan Johnson in recognition of the many years of service to the chapter. Director of Ceremonies Gary Mason, then announced that Christopher was accompanied by fellow grand officers Howard Griffiths and David Evans, Garston Group Chairman John Murphy, Provincial Grand Steward Dave Atkinson and past Provincial officers. All of whom were admitted and warmly welcomed into the chapter. The ceremony of installation was conducted with sincerity, calm efficiency and good humour, with Ken Bradley assisting the chapter by occupying the second principal’s chair. Ray, who has stepped into the first principal’s chair after the sad loss of Danny Wilson, did an excellent job of installing Mark Mellor as first principal. With second principal elect Graham Beardsmore, unable to be present on the night, Ken Bradley then installed John McKenzie into the chair of third principal, in his customary accomplished manner. 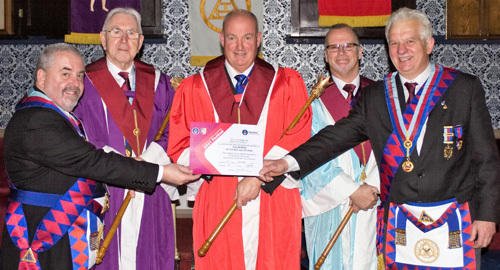 Pictured from left to right at the presentation of the vice patron’s certificate, are: Christopher Butterfield, Ken Bradley, Mark Mellor, John McKenzie and Paul Shirley. Wyn Jones gave a fine delivery of the robing address to both the first and third principals. Mark then duly invested his officers for the coming year and it was good to see so many stewards appointed, which illustrates the strength of the chapter. Christopher concluded the formal duties of the ceremony, giving the address to the companions, mirroring the quality of the work already undertaken. At the conclusion of the installation ceremony, Christopher was once again on his feet, this time to bring the best wishes and congratulations of the Grand Superintendent Tony Harrison and informing the three principals that Tony wished them a busy year, health and above all, that they continue to enjoy their Freemasonry. Mark was pleased to present Christopher with three cheques, one for £100 in support of Garston Masonic Hall, a second, for a similar sum to the Air Training Corps, Speke and the third for £200 to the MCF 2021 Festival. On behalf of all the recipients, Christopher thanked the chapter, at the same time informing the companions that this qualified the chapter the status of vice patrons of the festival. He continued by asking Paul Shirley, regional charity steward, to present the chapter with the ‘Vice Patron of the MCF 2021 Festival’ certificate. This concluded the formal business of the evening and the distinguished guests retired to enable the chapter to conclude any remaining matters. Following dinner, Christopher offered his own congratulations to all those who had taken part in the evening’s ceremony. He continued by saying that this was his first visit to Garston and expressed his appreciation of the facilities and the warmth of the welcome he had received.